PDF technology has now become a global standard – and one more stable and reliable than ever. Over the course of more than twenty years of committed development, this application-independent file format has become a real miracle worker. Protected by international standards, PDF is now an indispensable part of the modern business world. The rise and rise of PDF technology has not been confined to the business world alone. PDF is playing an increasingly critical role for digital document exchange in public and scientific institutions. … can be digitally signed? … can include additional comments? … can contain other files, such as Excel spreadsheets? … can be attached to another PDF file? … can also be accessed on your smartphone? … now meets legal regulations? 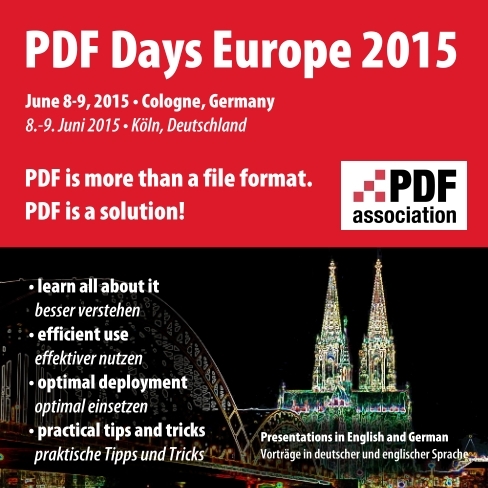 ECM strategists, developers and PDF experts, and provide suggestions for optimal PDF usage. 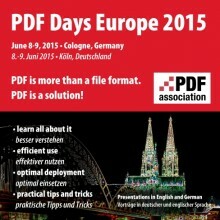 For more information visit http://www.pdfa.org/event/pdf-days-europe-2015-2/.